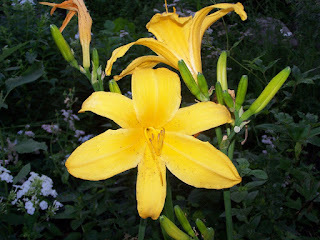 August is not my favorite time of year in the garden, but there are still some nice blossoms to be found. 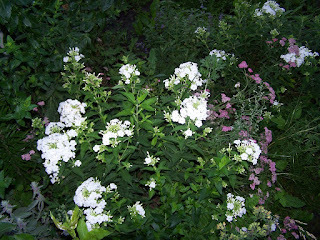 My favorite is the white phlox...it almost glows in the evening! Blogger isn't cooperating, so it took many tries to get just a few pictures uploaded. 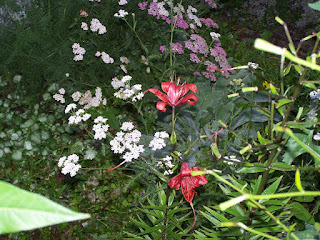 I hope you enjoyed the short tour of my garden this week. For more flower photos go to Bloomin' Tuesday. Beautiful blooms this week Deb. I love that white Phlox. They are so fragrant and long-blooming. Hi Deb, your garden looks beautiful this week! 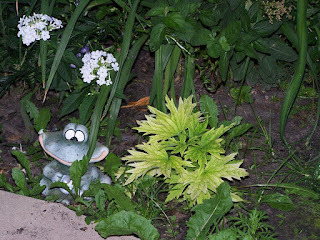 That cute little frog peeking through the plants is adorable! I also had a hard time downloading my photos with blogger tonight too! I finally rebooted my router box and it fixed the problem! The white phlox is really nice, but I especially love the yellow flower, whatever it may be. Is it some type of daylillie? Love the white phlox. What a brilliant shade of white! I was having trouble with pictures last night too. I thought it was because I was trying to post pictures of the moon! I love phlox. Very pretty- I love the white ones! My poor blooms and veggies are suffering this week because our Church is in Revival and I don't have time to get out there! It was nice to see yours though! All of your blooms are beautiful. I especially like the phlox. Also, the flowers on your sidebar are lovely.